بنی مسنی, محمود, کیوانی, یزدان, ابراهیمی, عیسی. (1397). مقایسه جمعیت‌های سیاه‌ماهی (Capoeta barriosi Lortet, 1894) رودخانه‌های قمرود، کر و شلدون براساس صفات شمارشی و ریخت‌سنجی هندسی. فصلنامه محیط زیست جانوری, 10(1), 145-152. محمود بنی مسنی; یزدان کیوانی; عیسی ابراهیمی. "مقایسه جمعیت‌های سیاه‌ماهی (Capoeta barriosi Lortet, 1894) رودخانه‌های قمرود، کر و شلدون براساس صفات شمارشی و ریخت‌سنجی هندسی". 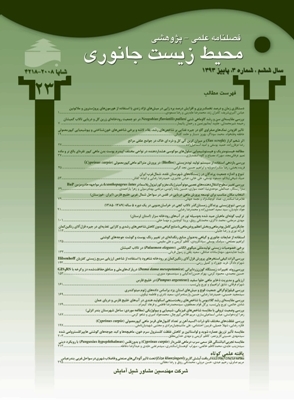 فصلنامه محیط زیست جانوری, 10, 1, 1397, 145-152. بنی مسنی, محمود, کیوانی, یزدان, ابراهیمی, عیسی. (1397). 'مقایسه جمعیت‌های سیاه‌ماهی (Capoeta barriosi Lortet, 1894) رودخانه‌های قمرود، کر و شلدون براساس صفات شمارشی و ریخت‌سنجی هندسی', فصلنامه محیط زیست جانوری, 10(1), pp. 145-152. بنی مسنی, محمود, کیوانی, یزدان, ابراهیمی, عیسی. مقایسه جمعیت‌های سیاه‌ماهی (Capoeta barriosi Lortet, 1894) رودخانه‌های قمرود، کر و شلدون براساس صفات شمارشی و ریخت‌سنجی هندسی. فصلنامه محیط زیست جانوری, 1397; 10(1): 145-152. این پژوهش به منظور بررسی تفاوت‌های ریخت‌سنجی هندسی و مقایسه صفات شمارشی با هدف درک الگوی تفاوت‌های بالقوه بین جمعیت‌های سیاه‌ماهی سه رودخانه کر ، قمرود و شلدون در حوضه آبریز نمک انجام شد. برای این منظور تعداد ٩٠ قطعه سیاه‌ماهی Capoeta barroisi شامل ٣٦ قطعه از رودخانه کر (با میانگین ظول کل و انحراف معیار 7/79±36/41) و ١١ قطعه از رودخانه قمرود (2/40±36/28) و 43 قطعه از رودخانه شلدون (29/34±69/10) صید شدند. نمونه‌ها پس از بی هوشی در محلول ۱٪ گل میخک و تثبیت در فرمالین ۱۰٪، برای مطالعات بعدی، به موزه ماهی‌شناسی، منتقل و در الکل ۷۰٪ نگه داری شدند. پس از ثبت صفات شمارشی، از نیم رخ چپ ماهیان عکس‌برداری به عمل آمد و تعداد ۱۵ لندمارک بر روی تصاویر دو بعدی انتخاب و رقومی‌سازی شدند. صفات شمارشی و داده‌های شکلی حاصله پس از آنالیز پروکراست )روی هم‌ گذاری(، با استفاده از روش‌های آماری چند متغیره PCA و CVA مورد تجزیه‌ و تحلیل قرار گرفتند. نتایج تجزیه به مؤلفه‌های اصلی و کلیه نتایج تحلیل همبستگی کانونی صفات شمارشی و روش ریخت‌سنجی هندسی نشان داد که جمعیت‌ها با یکدیگر اختلاف معنی‌داری دارند (0/05>P) و دو جمعیت شلدون و قمرود در یک گروه و جمعیت رودخانه کر در یک خوشه جداگانه‌ای قرار گرفتند. Asadollah, S.; Soofiani, N.M.; Keivany Y. and Shadkhast, M., 2011. Reproduction of Capoeta damascina, a cyprinid fish, in Zayandeh-Rud River, central Iran. J. Appl. Ichthyol. Vol. 27, pp: 1061-1066. Asadollah, S.; Soofiani, N.M.; Keivany, Y. and Hatami, R., 2017. Age and Growth of the Mesopotamian Barb, Capoeta damascina, in Central Iran. Iran. J. Fish. Sci., In press. Costa, C. and Cataudella, S., 2007. Relationship between shape and trophic ecology of selected species of Sparids of the Caprolace coastal lagoon (Central Tyrrhenian Sea). Env. Biol. Fish. Vol. 78, No. 2, pp: 115-123. Coad, B., 2017. Freshwater fishes of Iran. www.briancoad.com. last Accessed on 20 March 2017). Guill, J.M. ; Hood, C.S. and Heins, D.C., 2003. Body shape variation within & among three species of darters (Perciformes: Percidae). Ecology of Freshwater Fish. Vol. 12, No. 2, pp: 134-140. Helfman, G.; Collette, B.B. ; Facey, D.E. and Bowen, B.W., 2009. The Diversity of fishes. 2nd edition. Wiley-Blackwell. 736 p.
Jalili, P.; Eagderi, S. and Keivany, Y., ‏. 2015Body shape comparison of Kura bleak (Alburnus filippii) in Aras and Ahar-Chai rivers using geometric morphometric approach‏. Research in Zoology, Vol. 5, No. 1, pp: 20-24. Keivany, Y.; Nasri, M.; Abbasi, K. and Abdoli, A.; 2016. Atlas of inland water fishes of Iran. Iran Department of Environment Press. 218 p.
Pinheiro, A.; Teixeira, C.M. ; Rego, A.; Marques, J.F. and Cabral, H.N., 2005. Genetic & morphological variation of Solea lascaris (Risso, 1890) along the portugese coast. Fish. Res. Vol. 23, No. 3, pp: 67-78. Poulet, N.; Berrebi, P.; Crivelli, A.J. ; Lek, S. and Argillier, C., 2004. Genetic and morphometric variations in the pikeperch (Sander lucioperca) of a fragmented delta. Arch. Hydrobiol. Vol. 159, No. 4, pp: 531-554. Razavipour, P.; Eagderi, S.; Poorbagher, H.; Javanshir Khooi, A. and Keivan, Y., 2015. Phenotypic plasticity of the Tuini fish, Capoeta damascina, (Actinopterygii: Cyprinidae) populations in Iranian part of Tigris basin using geometric morphometric approach‏‏. J. Anim. Res. Vol. 28, pp: 170-179. Siami, M.; Keivany, Y. and Farhadian, O., 2017a. Reproductive characteristics of Siahmahi, Capoeta damascina (family Cyprinidae), in Beheshtabad River, Tigris basin. Sri Lanka J. Aquat. Sci. Vol. 22, No. 1, pp: 21-27. Siami, M.; Keivany, Y. and Farhadian, O., 2017b. On some growth characteristics of Siahmahi (Capoeta damascina), in Beheshtabad River of Chaharmahal and Bakhtiari. Submitted. Smith, G.R., 1966. Distribution and evolution of the North American catostomid fishes of the subgenus Pantosteus, genus Castostomus. Miscellaneous Publications, Museum of Zoology, University of Michigan. 129 p.
Tudela, S., 1999. Morphological variability in a Mediterranean, genetically homogeneous population of the European anchovy. Engraulis encrasicolus. Fish. Res. Vol. 42, No. 3, pp: 229-243. Turan, C., 2000. Otolith shape and meristic analysis of herring (Clupea harengus) in the North-East Atlantic. Arch. Fish. Mar. Res. Vol. 48, No. 3, pp: 213-225. Wootton, R.J., 1999. Ecology of Teleost Fishes. 2nd edition. Springer, London. 392 p.